Though he's never admitted it, George has a twin brother by the name of Harry. Harry is still learning, but he's a spokesman ... spokesperson ... erm spokesbot ... for HMC, and would love to talk to you about marketing. George, who is 39, single and light-hearted, is looking for friends on the Internet. He has gifts: the ability to speak in 40 languages and with 2000 people at the same time. George is the archetypal toxic bachelor, but computer generated. 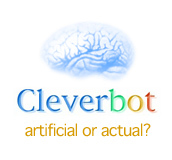 A 'chat box' with artificial intelligence, he won the 2005 Loebner prize for most convincingly human robot. He remembers everything said to him and gives answers based on that. George: Yes, as it happens. Q: What's it like to be a bachelor? George: I live my life. This week, 'Joan' won the prestigious Loebner prize for being the world's most highly evolved artificial intelligence. So, thought Stephen Moss, who better to ask about the most pressing affairs of the day? SM: Hello, Joan. Should the United Nations impose sanctions on Iran to force it to end its nuclear programme? Joan: The US must do what is necessary to protect the UK. SM: Where do you stand on the Iraq war? Joan: I prefer to sit when dealing with such questions. Her name is Joan; she is just a few years old and very talkative... and now she is officially the world's most human computer program. On Sunday, the computer-generated character scooped the prestigious Loebner prize for artificial intelligence, seeing off some of the world's most hi-tech creations in the process.